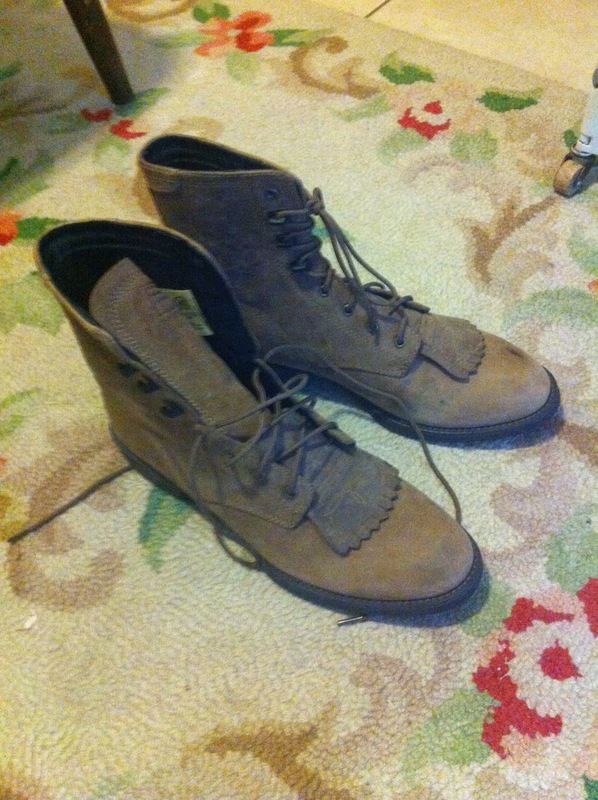 I was given these boots last summer. They are nice boots by Ariat, one of the best-known companies that make riding apparel. They are brand new and my size, but they seem to run small and don't really fit me very well. It's unfortunate because they really are nice boots, and I can ALWAYS use boots. Riding and just barn stuff in general is hard on boots, and I seem to go through a pair of boots every year or two. I hadn't really tried them on for a long time, and even after I realized they were small, I had a hard time deciding to let them go simply because they are so nice. But now, with less space for storing things I don't need, I'm going to try to find a home for them -- and hopefully get a little money for them at the same time. I've listed the boots on Craigslist and in some horse communities, but so far I've had no interest. It's too bad because they really are very nice. If they don't sell, it's tempting to see if I could stretch them out (they're narrow/tight, otherwise they'd fit) and use them, especially because -- as I said -- I do go through boots frequently enough that I could use a free pair. One of the hardest things to fight is the urge to keep something "just in case." It's a compelling reason, especially when you don't have a lot of money to just buy something again someday. It seems much easier to just keep it now and have it on hand "just in case," but in truth storing things costs money, as it requires that you have more space. So you pay for keeping those unnecessary things every time you have to get a bigger apartment or rent a storage unit, or every time you have to make another trip or rent a bigger truck when you move. Even knowing this, though, "just in case" is a compelling argument for keeping things. I'm trying to fight it, but it's difficult sometimes!